The Junior Frontiers of the Mohawk Valley is proud to represent the goals and overall mission of the Frontiers International, specifically the Mohawk Valley Frontiers International. In keeping with the spirit of our senior club, we strive to develop the civic responsibility and community caring that has been passed down from our elders. Moreover, our goals, mission and programs all aim at helping students develop into well rounded citizens who will become assets to our local and national community. 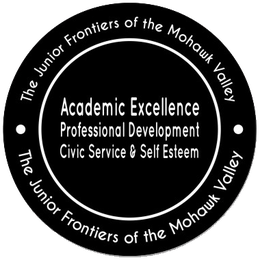 The Junior frontiers of the Mohawk Valley is based out of Utica/Rome, NY, where our senior club resides. We also have satellite sites in Syracuse and Buffalo, New York. We have approximately 70 members in Utica, and 62 members in Syracuse and 25 members in our new Buffalo site. Currently, all of our sites are in New York State. We meet in Utica on the 1st and 3rd Monday, Syracuse the 2nd and 4th Monday, your Buffalo meeting's are held on the 1st and 2nd Saturday's of every month. We have an almost equal amount of male to female members and our ages range from 11 to 19 years old. We have two regularly scheduled meetings per month at each site, for about 2 hours each meeting. Our first meeting of the month is our business meeting and the second meeting of the month is our Professional Presentation Series or our project meeting day. Our members have achieved high academic and socially responsible goals over the course of the life of our organization. We are proud that every year, our twelfth graders all graduate from high school and many with academic accolades. For the past five (5) years, every one of our graduating high school seniors have been accepted into a college of their choice, and have received an award of financial aid and or scholarship. We accomplish our goals using a four-step program. We emphasize educational excellence, professional development, civic service and self esteem. We utilize a number of programs, projects, activities and trips to accomplish our goals. Some of our projects and trips includes a Historical Black College Tour every year, a State University of New York college tour every year; an Ivy league College Tour every year; and various trips to local Junior Colleges every year. We have a Professional Presentation Series once per month, where we bring in Professionals from different fields to discuss what they do, and how did they get there. We have a "Discover our Elders" project where we are interviewing the elders of our community, and documenting their life stories and wisdom. We have various voluntary programs throughout the year where we work with the elderly, the shelters and food banks of our community. We are constantly reading and writing about our history and our country and learning more about ourselves everyday. Today we continue to strive for excellence in our everyday lives. We are grateful for the Frontiers International, and specifically for the Mohawk Valley Frontiers International, our parent organization. We believe that with programs like the Junior Frontiers, students of color will continue to grow and strive to be the best we can, while we prepare ourselves to be leaders in our city, our state and our nation.